Some of the home sites in Southern Highlands real estate include elevated sites up to 14 feet higher than other sites. There are other unique Las Vegas home sites including overlooking the Southern Highlands Golf Club and cul de sac locations with unobstructed views. There are two story homes for sale with starting floor plans from 4,328 to 5,441 square feet. Additional custom touches and options can go up to 6,000 square feet. The Tuscan Cliffs enclave of semi custom homes will include 155 estate homes. Prices for these Energy Star new homes start from $1.05 to $1.1 million. There is a high level of customization in these Southern Highlands luxury homes. 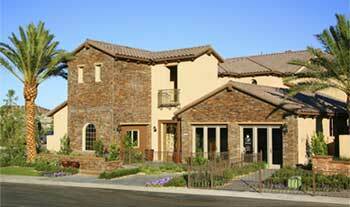 Tuscan Cliffs luxury home sites released near Southern Highlands Golf Course.